The in vitro development of functionally mature blood cells from human pluripotent stem cells [hPSCs; including human embryonic stem cells (hESCs) and induced pluripotent stem cells (hiPSCs)] has proven ideal way to gain information during human early embryonic/fetal hematopoiesis, which never can be mimicked in other species. We recently established an efficient method to produce large quantity of pure and functionally mature eosinophils from hPSCs. 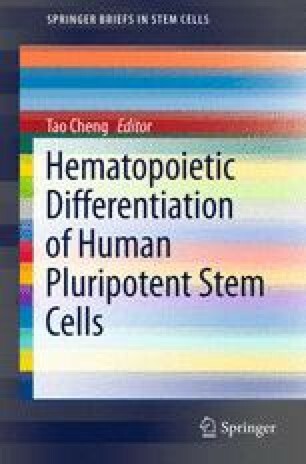 The method includes majorly three steps: (1) induction of hematopoietic stem/progenitor cells by coculturing hPSCs with mAGM-3 or mFL stromal cells; (2) large expansion of hPSC-derived hematopoietic stem/progenitor cells and inducing differentiation toward myeloid lineage; and (3) directed differentiation of myeloid progenitor cells into functionally mature eosinophils. The eosinophils induced from hPSCs in our system showed similar morphology and surface marker expression with those in peripheral blood through May-Grϋnwald-Giemsa staining, transmission electron microscopy (TEM) analysis, flow cytometric analysis (FACS), RT-PCR analysis, and immunofluorescent staining. Furthermore, chemotactic migration and degranulation ability have confirmed the maturity and function of these hPSC-derived eosinophils. The induction of eosinophils from hPSCs provides us with a perfect model to study the germination, development, differentiation, and maturation of human eosinophiles, which has not been well defined yet. It also provides novel approach to develop patient-tailored therapies by iPSCs for severe allergic diseases as well as deficiencies in early innate immunity. In this review, we will describe the details of methodology for generating these functionally mature eosinophils from hPSCs and the related assay for their function and maturation. Ma F, Gu Y, Nishihama N, Yang W, Yasuhiro E, Tsuji K. Differentiation of human embryonic and induced pluripotent stem cells into blood cells in coculture with murine stromal cells. In: Ye K, Jin S, editors. Human embryonic and induced pluripotent stem cells (pp. 321–335). Totowa: Humana Press (2012). doi: 10.1007/978-1-61779-267-0_23. ISBN 978-1-61779-266-3 (Published by Springer Science + Business Modia, LLC 2011).